PewDiePie (ნამდვილი სახელი — ფელიქს არვიდ ულფ ჩელბერგი, შვედ. Felix Arvid Ulf Kjellberg; დ. 24 ოქტომბერი, 1989, შვედეთი) — შვედი ვიდეობლოგერი და შოუ-ბიზნესის მოღვაწე. მისი YouTube არხი გამოწერილი აქვს ყველაზე მეტ ადამიანს (89 მილიონი), ხოლო მის ვიდეობს მთლიანობაში 17.1 მილიარდი ნახვა აქვს. The Guardian-ის თანახმად, 2014 წლისთვის მისი შემოსავალი 7,4 მილიონი ამერიკული დოლარი იყო. ↑ PewDiePie about. YouTube. დაარქივებულია ორიგინალიდან - 22 December 2013. წაკითხვის თარიღი: 11 November 2017. ↑ Stuart Dredge. 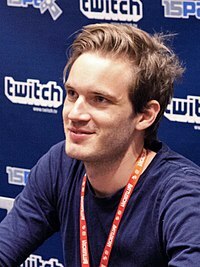 (2015-07-08) YouTube star PewDiePie responds to 'haters' over $7.4m annual earnings en. The Guardian. წაკითხვის თარიღი: 2015-12-31.
ეს გვერდი ბოლოს დარედაქტირდა: 11:51, 12 მარტი 2019.